With the urbanization of the population increasing day by day it becomes less and less availability of areas for children to play outdoors. That along with the smart phone and gaming apps that go with them, we are seeing a generation of children growing into adulthood and having less and less interaction with the outdoors. Studies are being conducted on the effects of this trend and some of the findings are alarming. 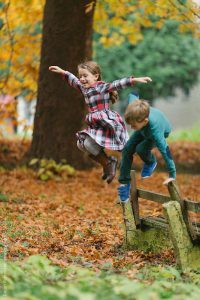 The results of these studies are finding that the benefits of children playing outdoors are a necessary part of a balanced and well functioning society. Many of us grew up being taught that work is good and we should not play too much. Work is good. But that does not mean that play is bad. Self directed play can teach organizing skills and with others involved it teaches working together and consideration for others. Playing also teaches creativity. That is an almost unknown quantity today with everything being digitized and imaged to look almost real. When children are allowed to be outdoors and make up their own play things they become inventive and come up with amazing ideas. Images are not fed to them, but they imagined and created. One study found that half the children in America spend an average of an hour or less outdoors each day. The study stated that this is less time than is allowed to prisoners in a maximum security prison. If we allow prisoners to have at least an hour a day for outdoor activities, should we not encourage our children to spend at least that more and a lot more. Let’s look at some of these benefits. Do you think these qualities are good? 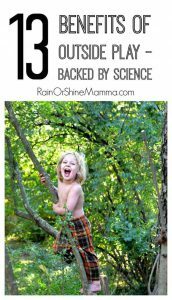 Here are some of the qualities cultivated by outdoor play. How about creativity? Creative people are those who come up with the ideas that produce so much of the things that we use in our daily life. Without creativity a society will stagnate. Consider a communistic state where creativity is limited to what the state allows. And play is not a part of a communist state. What about resiliency? The ability to fall and get up again and again and again. How many people have become a success not on the first try or on the second try or even sometimes on the 100th try, but they never quit until they succeeded. Without playtime outdoors this characteristic may very well never develop. How about leadership? This is one of those qualities in which “the cream rises to the top”. Not all are leaders. Some are followers. And that is alright. When leaders succeed, so do followers. Outdoor play helps to define and refine leaders. Resourcefulness comes naturally to outdoor playing. When you do not have the tool, you can find a stick that mimics the tool. When you do not have a house, you create it from a cardboard box. When you need to call someone a block of wood becomes your phone. Imagination will kick in to high gear. 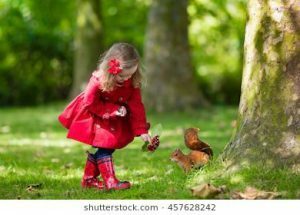 Being outdoors will stimulate curiosity. Just observing plants and animals which are in their natural habitat will cause one’s interest to be peeked. How does a bird fly? How is that ant able to carry such a big load? How does that bee know which way is home? How does a cat climb a tree? Why doesn’t a squirrel fall when he comes down a tree? Only being outdoors can these questions come into mind. The qualities delineated above do not come about through a structured environment. We are not talking about and unfettered atmosphere where there are no guidelines. There are guidelines for creativity as well. Such as. You may play outside in the yard but not in the street. You may play with your friends but not with strangers who your parents have not met. You may not be abusive or unkind to those with whom you play. None of these guidelines will restrict creativity or development of quality characteristics. As often as possible a family should take adventures together outdoors. The parents can teach the children about certain plants or animals or geographies. Not only will these outdoor activities increase curiosity but will create a bonding together of the parents and children. There are few, if any, downsides to outdoor playing. It is unfortunate that government and those who seek to make money from the necessity of having housing that they build housing which practically does away with room to get outside and play. If they do allow for such, it is minimal at most. Let us encourage our leaders to consider the need for outdoor activity not only for our children but for adults as well. 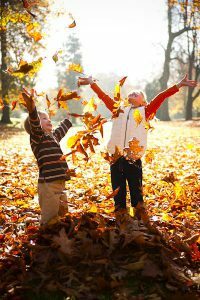 If you are a parent consider making time available each day for your child to play outdoors. If you have a yard, get outside with them or insist that they play outside instead of being sedentary in front of a TV or computer playing games. Plan projects in the yard to plant flowers or other plants to watch them grow. Take into consideration that when our Creator created man He placed him outdoors in a garden. It does not say that He built a house for him, but a garden. So when considering the benefits of children playing outdoors, remember, we are created to be outdoors.